H.N. Moseley : Voyage of HMS Challenger, 1872-1876. In the Admiralty Islands "The natives swim hand over hand. They never take a header in diving, but jump in after anything upright, sinking feet first with the body inclined forwards." - page 467. The convicts receive a small pay, and are obliged to find their own living. The black ones are obliged to work for ten hours daily on Government plantations. Some of these convicts go out fishing on small rafts made of three or four logs lashed together, provided with a small stool for a seat. A basket for the fish is placed on the raft in front of the seat, and a small fishing-rod is stuck up behind. The men steer these rafts with great dexterity through the surf with a paddle, usually standing up to paddle, and sitting down to fish. At a distance, the raft being almost entirely under water, the men look as if walking on the water. These rafts were termed "catamarans" by the naval officers. Sailors are apt to apply this term to any out-of-the-way canoe or boat for which they have no other name. I believe the word is of South American origin. No boats of any kind are allowed on Fernando do Norhona, for fear the convicts should use them to escape with. There are two towns at Caxoeira, one on each side of the river. These consist of the usual whitewashed houses and two or three churches, one broad street and several narrow ones, with mostly dirty dilapidated two-storied houses tailing off towards the country into one-storied hovels. On the river, canoes hollowed out of a single tree trunk, simple and trough-like in form and pointed at both ends, ply between the town and its suburb. They are large enough to contain six persons. At Bureta I was able to buy, for sixpence each, a dozen stone Adzes, such as were used for canoe making in the Fijian group, before iron implements were imported. The adze blades are of basalt. They are bound to the handles with twisted or plaited cocoanut fibre. Showing two methods in which the blades are mounted. handles, and are now used by the people who have not parted with them, for cracking nuts. The flat lower part of Mbau [Island] which is raised only a few feet above the sea, consists of made ground, built up of blocks of coral, and mud and stones collected from the vicinity at low water, and secured all around against the action of the sea by means of large slabs of a sandstone (said to come from the main island), having been brought in canoes a distance of several miles. We saw at Navusa canoe-building going on. For an adze, a broad chisel was used, fixed into what had been the handle of an old stone adze, just as the Admiralty Islanders fix blades of iron tub hoop into the old handles of their shell adzes. A chisel of hard wood was used for caulking, shaped just like our own caulking irons. may pass by barter from island to island here over wide distances, even to New Hanover and New Britain. and not turned up and built so as to form figure-heads, as at New Guinea and the Aru Islands. The canoes' hulls are formed each of a hollowed trunk of a tree, with a single plank built on above it, and a gunwale-piece as a finish. The hollowed-out portion has slightly and equally rounded sides, and is not flat on one side and rounded on the other, as in the Carolines. The mast is stepped in the bottom of the canoe, just in front of the horizontal outrigger platform. A pole of about similar length, with a natural fork at the top, is stepped against the foremost end of the cross-bar of the horizontal outrigger, and it and the mast being inclined towards one another, the mast is fitted into the fork at the top of the pole, and roused down with a rope- stay so as to remain firm in that position. The bow and stern are ornamented with a simple carved ridge or two, and with Ovulum ovum shells, a single row of a dozen or so being fastened on either side. A horizontal outrigger extends from the middle of the canoe on one side, and is connected with a long canoe- shaped float, and opposite to it is an inclined shelf or deck supported on two or three stout projecting beams. A platform is formed with planks on the horizontal outrigger, and on the outer part of this a large store of spears and the mast and sails are kept. some of the crew often sit. The canoes are from 30 to 40 feet in length. The sail is nearly square in form. It is hoisted to the top of the mast, and set so that one corner is uppermost. The opposite corner does not nearly reach down to the canoe, hence the square sail being high above the water has a very peculiar look when seen over the sea at a distance. As at all Pacific islands, apparently the outrigger platform is the place of honour, and the seat of the head-man or chief. Oto, the chief of Wild Island, never occupied any other position, and never touched a paddle. Small canoes with single outriggers, holding one or two persons, are used for paddling about the reefs round the islands. The large canoes are manned by from 10 to 15 men. The natives swim hand over hand. They never take a header in diving, but jump in after anything upright, sinking feet first with the body inclined forwards. Long sein-like nets are used for fishing. These nets are probably the property of a community, for they are kept hung up in the temples. I saw one about a fathom in depth and of very considerable length. Hand nets fixed on elbow-shaped frames of wood are also used. Stake nets are used, and lines of stakes are conspicuous objects just off the shore near the villages. Fish-hooks are used made of Trochus shell, all in one piece. They are of a simple hooked form without barb. The natives did not seem to care for steel fish-hooks, and apparently did not, at first at least, understand their use. It is possible that they have never found out the plan of using bait on a hook. If the natives did not understand the use of baits, it is no wonder that they despised European fish-hooks. bound on to it, the shell being ground down until only one lateral half of it remains. Every man almost carried one of these small adzes hung on his left shoulder. From the houses large adze blades made of Tridacna and Hippopus shell were obtained. They resemble somewhat those of the Carolines, but are very roughly made indeed, only the actual edge being ground. None were seen mounted, and they appeared to have gone out of use. Cape York is a sort of emporium of savage weapons and ornaments. Pearl shell-gathering vessels (Pearl shellers as they are called) come to Somerset with crews which they have picked up at all the islands in the neighbourhood, from New Guinea, and from all over the Pacific, and they bring weapons and ornaments from all these places with them. Moreover, the Murray Islanders visit the port in their canoes, and bring bows and arrows, drums, and such things for barter. The water police stationed at Somerset deal in these curiosities, buying them up and selling them to passengers in the passing steamers, or to other visitors. Hence all kinds of savage weapons have found their way into English collections, with the label "Cape York," and the Northern Australians have got credit for having learnt the use of the bow-and-arrow. I believe that no Australian natives use the bow at all. The most interesting feature about pile-dwellings seems to be their very wide geographical extension. Representatives of almost all races of man seem to have arrived at the same expedient, apparently not by any means a simple one, independently of one another. There are the well-known Pfhalbauten of Switzerland, in South America the similar houses of the Cuajiro Indians, on the Gulf of Maracaibo. In this case, piles were driven into the bottom of the lake, and the interstices filled in with stones and mud, so as to form a platform. There are the well-known New Guinea pile-dwellings, such as seen by us at Humboldt Bay, and there are also the pile- dwellings of all the Malay races. The Gilbert Islanders construct also houses raised on piles, and a number of these natives from the island of Arorai, who were taken to Tahiti, to serve as labourers on cotton estates, have put up houses of this kind for themselves in the latter islands, amongst the very different dwellings of the Tahitians themselves. It seems probable that the idea of a pile dwelling has in many cases arisen from the escape of natives from enemies by getting into a canoe or raft, and putting off from shore into a lake or the sea, out of harm's way. 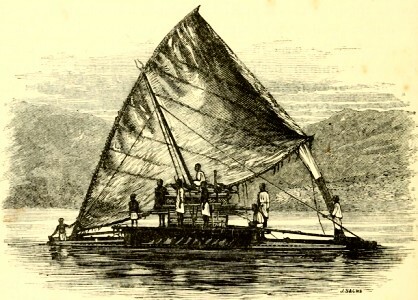 If the attacked had to stay on such a raft or canoe for some time, they would anchor it in shallow water with one or more poles, as the Fijians do with their canoes on rivers, and hence might easily be derived the idea of a platform supported on piles. * S. L. Cameron, Coram. K.N.," Across Africa," Vol. II., p. 65. London, 1872. ** Rev. Eichard Taylor, F.L.S., "On the New Zealand Lake Pas." Trans. N. Zealand Inst., Vol. V, 1872, p. 101. At Malanipa Island, a very small island, not far from Zamboanga, natives had felled a good many large trees to make canoes. The suitable trees are usually at some distance from the water. A straight broad road is cut through the smaller wood direct from the large tree to the sea-shore; and the smaller trees are felled so as to fall across the road. trunks the canoe is hauled to the shore. The open avenues were extremely useful in affording an easy road into the forest for collecting purposes. There were then 67 canoes in all present, and this was the greatest number that was seen. live natives, some four, some three, some only two. canoes on one side of the vessel there were 148 natives, or about an average of three to a canoe. In all, therefore, there must have been 200 natives. The bows of the Humboldt Bay natives are cut out of solid palm-wood and have a very hard pull. They taper to a fine point at either end, and in stringing and unstringing them a loop at the end of the string is slipped on and off this point and rests in the extended bow on a boss raised with wicker-work, at some distance from the bow-tip. The bows are strung quickly by their lower ends being placed between the supports of the canoe outriggers as a fulcrum. If an attempt be made to string a bow, by resting one end on the ground, the tapering end snaps off directly pressure is applied. learnt the improvement of the notch and feather. to their arrows, but still no feather. * For the distribution and various forms of bows and arrows, see Gen. Lane Fox, F.R.S., &c, " On Primitive Warfare." Journ. of United Service Inst, 1867-9.
bought a stock of about £300 worth for the ship's use. blade 12 or 14 inches in length ; cotton cloth, Turkey red and navy blue, beads, and other similar articles. shell hatchets, and models of canoes, to sell to ns, which were as badly made as the trade gear which we gave in exchange. They made signs that the ore of manganese which they use came in canoes from a distance eastwards. The natives delighted in being towed along in their canoes by the steam pinnace, and clapped their hands with delight ; but of course did not understand how the boat moved, nor apparently see in the fire the cause of motion. to the cutter when sailing to get a tow for their canoes, and apparently expected to see the boat go off, head to wind, in the same style. The word is not "of South American origin," but from the Esat Coast of India. under the commands of Capt. Sir G. S. Nares and Capt. F. T. Thomson. Geoff Cater (2014) : H.N. 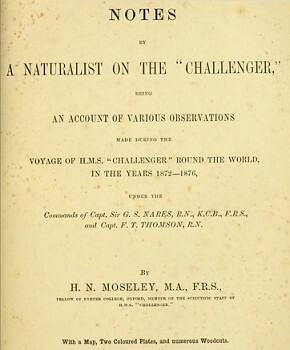 Moseley : Voyage of the Challenger, 1872.